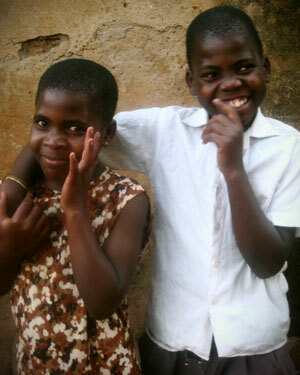 Sentongo and Nagawa are sister and brother who lost both parents to HIV in Mpambire Mpigi District at the age of 3-7. Both were brought to kampala by their paternal Aunt who earned her income by selling cooked cassava at night on the road side and the two children were told to sit out side their house waiting for the Aunt to come back late in the night at 12:00am when she finishes her sales. This was so risky to such children in the slums and when the Aunt came back they are already asleep then she would beat them up saying that she is not the one who told their father to bring the curse of HIV in the family. Apart from being beaten these children were malnourished. Tipped Tusitukirewamu Volunteers who approached the Aunt but failed attend to the volunteers so they took the next step to take the children for an HIV test to confirm their status and the results came out positive for both children. Sentongo says "when I grow up I want to be a pilot so that I and my sister can be in the plane all the time and the floods cant come to us but now Aunt is nolonger locking us out side I think she feared to be taken to kawempe police." In Uganda, the group Tusitukirewamu recruits HIV-positive adults to help give hope to others affected by the virus. For months Jaliya was condemned to live in her uncle's outhouse: a hut barely high enough for a child to stand up in. She slept on a dusty sack in the corner, banned from touching the family plates and soap, forbidden from playing with her cousins or attending school. Her uncle had bowed to the familial obligation to take in his niece when her parents died from Aids. But fearing the girl might also be ill and "contaminate" his own offspring, he kept her in total isolation. Fortunately for Jaliya, her guardian angel was about to appear. Regina Bayiyana was out shopping in Bwaise, the Ugandan capital's biggest slum, when a neighbour tugged at her sleeve. "You help sick children, don't you?" the woman said. "Well there's a girl hidden away in that house over there, and she desperately needs to go to hospital. Please help." As Regina approached the rickety outhouse, she could hear the whimpering of a frightened child. Eventually Jaliya was encouraged to come to the door. She had a grossly swollen stomach; the rest of her was painfully thin. Her arms and legs were covered in red bumps, pus was oozing from her ears and she was coughing blood. "Sadly this is a very common occurrence. Let's just call it ignorance," explains Florence Masuliya of Tusitukirewamu, a women's group that helps Aids widows and orphans in the slum and is funded by Action Aid, one of the three charities being supported by The Independent's Christmas Appeal. "We do much to fight the stigma attached to HIV/Aids, but for some people it can't be erased." After much persuasion, the uncle allowed Regina to take his niece to hospital but doctors demanded a relative be present before they would treat the child. The uncle was cajoled into accompanying them the next day – but then before the diagnosis. 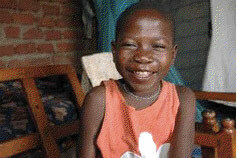 Jaliya was found to be HIV-positive and suffering from tuberculosis. Two and a half years later, Jaliya's life has been transformed. She lives with Regina, whom she calls "jaja" or granny, is near the top of her class, and is no longer afraid to play with the children in the neighbourhood. "She's changed, changed, changed," her guardian Regina says. "Before she was so ill – and so rude. Now she is a free spirit, much healthier and happy." At 5.4 per cent, Uganda's HIV prevalence rate is by no means the highest on the African continent but there are still 130,000 children under 14 thought to be living with HIV in the East African nation. Officially in Bwaise, home to 30,000 people, there are just 103 children registered as living with the disease, but aid workers know the real figure is much higher. Raising awareness about the disease is a large part of ActionAid's work – the women of Tusitukirewamu go out drumming in the sewage-strewn streets, gathering an audience and staging educational skits, before taking questions from the audience. Tusitukirewamu also provides a lot of practical assistance to women and children living with HIV/Aids. There is the guardian programme, where adults are trained to care for Aids orphans, given financial assistance to cover the children's food and school fees, and taught how to set up home gardens where they can grow produce such as mushrooms to sell at market. There are 25 adults currently enrolled in the scheme; funding has just come in to add another six, and there are 19 more volunteers waiting in the wings. The women's group also hands out monthly rations of maize flour and rice to widows who are struggling to raise their families after losing their bread-winning husband to Aids. This is particularly important for families on ARV drugs. Often the surviving relatives get the medication for free from the government, but can't afford to buy the food needed to take alongside the tablets. Action Aid provides 25m Ugandan shillings – about £8,000 – every year for general running costs, and additional funding for specific projects as and when they arise. Members of Tusitukirewamu (it means "United We Stand As Women") in the fight against HV/AIDS and social injustice in families, also try to generate their own income streams, making bracelets and bags, tie-dyeing fabrics and knitting jumpers. The secret of the group's success, however, are its volunteers. Pounding the streets of the slum, sporting red tags that proudly proclaim: "I got tested. How about you? ", they encourage women to confront their fears, navigate the medical system and stand a chance of saving their lives. "All of our volunteers are living with HIV/Aids so they have a unique insight into the problems people have," explains Ms Masuliya. "But they also act as role models; people can see that having the disease doesn't mean your life stops. Understand that their lives are greater than the virus they carry inside their bodies". Never give up to be taken by premature deaths. Rukia Ramathan, 47, is a case in point. In 2005, her husband died – officially of tuberculosis, although he had been hiding his HIV-positive status for months. "He knew, but he tried to keep it quiet. He didn't even want me to go to the hospital to see if I was also sick," she recalls. Not long after his death, Rukia came down with a fever and became unusually weak. She went for a blood test and it came back positive. "Tusitukirewamu helped me to become strong," she says. "Now I am not ashamed, I can stand in front of people and tell my story. New sufferers get scared, they think it's the end of them. But I tell them: 'Don't lose hope. You still have more things to do'". Many women have a success story to tell deriving inspiration from Ms. Masuliya Florence that their lives are greater than the virus they carry inside their body.